The late Joe and Jean Olivera lived a life of hard work, integrity, and charity in service to God, family, and country. As a result, they spent their lives building a legacy of love for each other, their family, and the charitable works of organizations like Marian Regional Medical Center. It is this spirit of concern for others and the desire to build for the future health care needs of Marian patients and families that prompted the Oliveras to establish a charitable gift annuity to benefit Marian. They chose to fund the annuity with a generous cash contribution that generated a guaranteed rate of return in the form of monthly, quarterly or annual payments that continued throughout their lifetime. Depending upon the age of the annuitants, the contributor is often guaranteed a rate of return that exceeds more typical fixed instruments like Certificates of Deposit, bond funds or savings accounts. The annuity also provides a significant charitable tax deduction, and the satisfaction of knowing that in the future, the remnant of the annuity will benefit the patients and families of Marian. Anyone who ever had contact with the Oliveras know that they are known for their charitable giving and service to the community. In fact, a visitor to the main lobby of the new hospital will find Joe and Jean’s name mentioned on every donor acknowledgement plaque displayed as testament to a lifetime of their generosity. 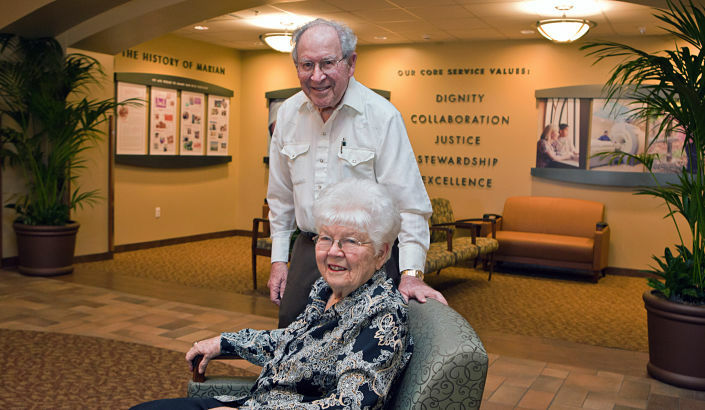 Joe’s history of service to the Sisters of Saint Francis and their work at Marian spans many decades, starting with his tenure on the Marian Regional Medical Center Board of Directors. He was instrumental in the expansion of the campus to meet the needs of a growing community. He also served as a member and a Chairman of the Foundation Board of Trustees. He continued to serve on the Foundation Board as an honorary member until his passing. The Olivera family's legacy of love, kindness, and thoughtful stewardship will live on to benefit future generations of Marian patients and families.